Newspaper pellet litters are perfectly safe for your little buddy. Picking the right type of cat litter for your new addition is a daunting decision. With endless options available, how do you decide what's best? Certain varieties are generally safe for kittens as they learn to use the litter box, but ask your veterinarian if you want expert advice. Pellets made from recycled materials tend to be safe for young felines. Some of the most common pellet litters are made from processed newspaper or pine. However, you'll also find pellets made from wheat or peanut shells when you head down the pet aisle. These litters aren't likely to cause blockages in young Scruffy's digestive tract, should he ingest any, and are gentle for his fragile paws. Additionally, since the pellets are somewhat large when compared to clumping litter, they won't stick to his feet, making him less likely to track them all over your home. Using plain old clay cat litter is another way to go with kittens. Opt for unscented varieties in the beginning. Strong unfamiliar scents may bother his nose, making him unwilling to use his potty. If he seems to dislike the texture while litter box training or has a hard time digging in it, pour a small amount in half of the box. Place a towel or piece of cardboard under the empty side so the box lies on a bit of a slant. This gives him the choice to go on the smooth surface or learn to dig in the litter. If he winds up going on the uncovered side, the tilt makes urine drip down toward the litter, where it absorbs. While kittens are learning all about their new surroundings, they may test things by putting them in their mouths -- much like infants. While it sounds gross, your tiny purring pal may even be enticed to nibble on kitty litter to see what it is. Because of this, during his first couple months of life your vet might suggest not using certain types of litters. Avoid filling the box with clumping or silica cat litter too soon. These litters can cause gastrointestinal problems if he swallows a large amount. If you eventually hope to use clumping litter, or even silica, wait until Scruffy is at least 3 or 4 months old and understands that litter isn't edible, suggests the ASPCA. Type of litter isn't the only concern. You also need to ensure you get a box that is easy for Scruffy to get in and out of. Kittens have short little legs and can't climb over the massive walls of their mama's litter box. Some boxes have an inlet on one side that is low and easy for baby Scruffy to maneuver over. Ideally you should have one litter box for each cat and an extra one just in case, reports the Humane Society of the United States. This way if your fuzzy pal needs to go, he won't have to wait his turn for the only toilet in the house, possibly preventing accidents. Can Cats Use Non-Clumping Litter After Declawing? How Old Does a Kitten Need to Be Before Eating Treats? How Often Should You Change Kitty Litter? Do Mother & Kittens Use the Same Box? How Old Are Kittens When They Start to Drink Water? When Should Kittens Get a Litter Box? 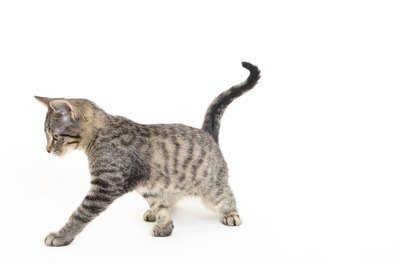 When Can a Kitten Use Clumping Litter? What Does a 4-Week-Old Kitten Eat?